I am not quite sure where the summer went. Last thing I remember, we were saying goodbye to our students and digging in for a boring, pleasant summer. Today the kids all came back to school and the chaos begins. Even Nathaniel had a “first” at school today. It was his first day in the Infant B classroom. He is crawling, pulling up and starting to cruise so he can’t be with all the tiny, immobile babies any more. Fortunately three other babies are moving up with him, so he will have some buddies. The teachers and parents were all a bit teary this morning. I can’t believe he is going to be 9 months old on Friday. Here are some cute pictures of him. 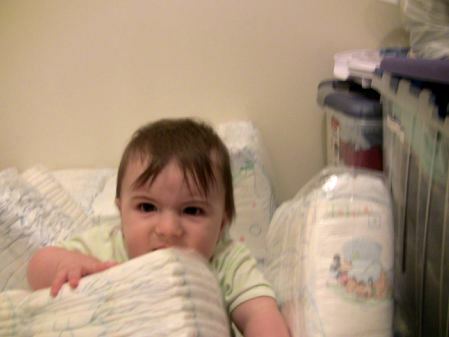 Here he is in a gigantic pile of diapers. Note the crazy hair. Here he is later that day after his first hair cut. He was very well behaved and looks sooo handsome. Here is some of my recent stitching. 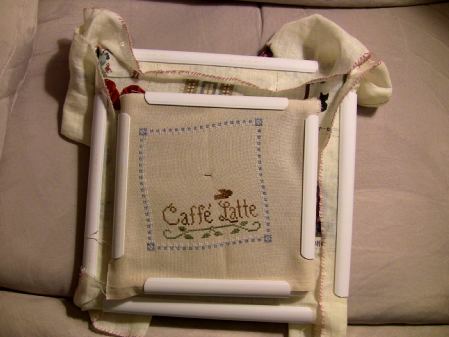 I have been working on Cafe Latte. Yes the border is off. 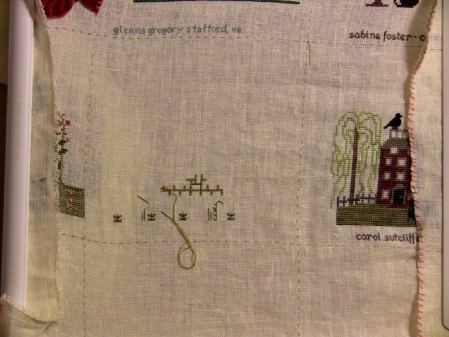 I will be fixing that later:) I really like stitching LHN pieces. And I also started on Glenna’s RR. It is not much, but it is an Elizabeth Design piece. Nathaniel is such a cutie. Yes, I know it’s amazing how fast they grow up, quite often it only feels like yesterday that they were born. Your Cafe Latte is looking lovely. Aww what a darling. I love his new haircut.